Diavolo is the Italian word for devil and refers to sauces seasoned with hot chiles. 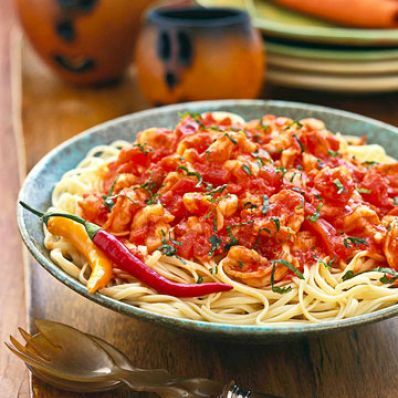 In this 20-minute recipe, red pepper flakes provide plenty of heat for a shrimp and tomato sauce that's tossed with linguine. 1 of 4 Heat oil in large skillet over medium-high heat. Add shrimp; cook 30 seconds. Add garlic, pepper flakes and 1 /4 teaspoon salt; cook, stirring occasionally, 2 minutes or until shrimp are curled and pink. Be careful not to overcook. With slotted spoon, remove shrimp to bowl. 2 of 4 Meanwhile, cook linguine in large pot of lightly salted boiling water until al dente, firm but tender, about 12 minutes. Drain well. 3 of 4 Stir together tomatoes, tomato paste, basil and remaining salt in skillet. Bring to boiling over medium-high heat; cook for 10 minutes or until sauce is thickened. 4 of 4 To serve, add cooked shrimp to sauce; gently heat through very briefly. Toss with the pasta or serve on top of it. Makes 12 servings. Per Serving: 474 mg sodium, 5 g fiber, 7 g Fat, total, 67 g carb., 19 g pro., 406 kcal cal., 1 g sat. fat, 67 mg chol.